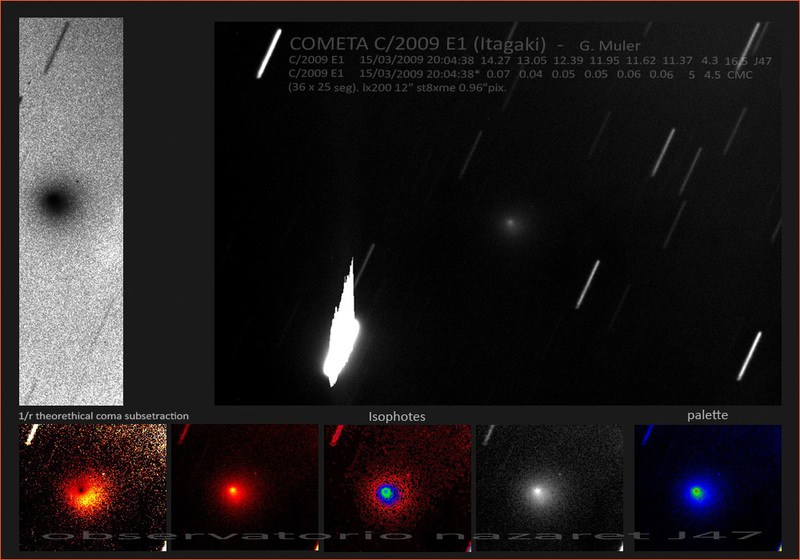 Early visual estimates put it at barely brighter than 10th magnitude, and on pictures C/2009 E1 (Itagaki) is mainly a compact fuzzball: It's orbit will bring it into perihelion in early April, wo it won't get much brighter. 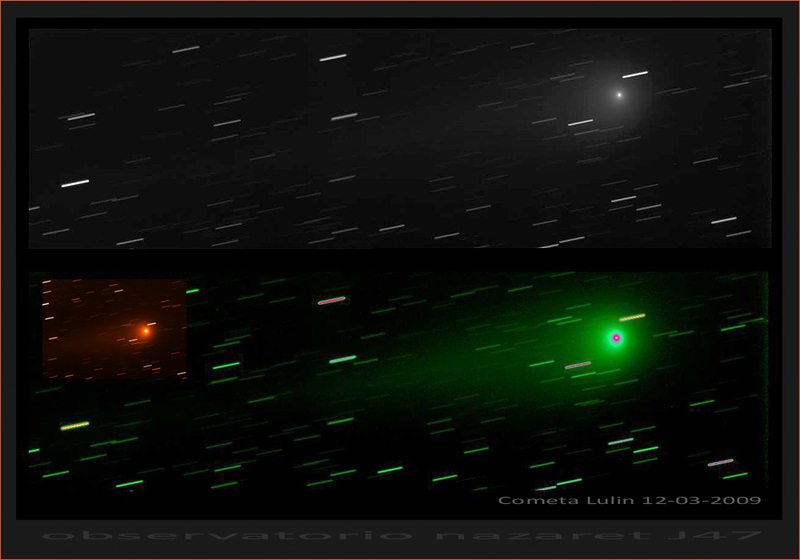 • Meanwhile for Lulin an analysis of perspective effects, a collection of pictures by one photographer spanning a long time and recent images of March 15 next to the Eskimo nebula, March 13 with an open star cluster (another picture), March 12 and March 11). From earlier times also a March 2 video, a long exposure from Feb. 25 (discussed here) and a Feb. 21 movie. • Regarding the 2007 mega-outburst of Holmes, there is a new paper (also here in PDF) discussing IR data. 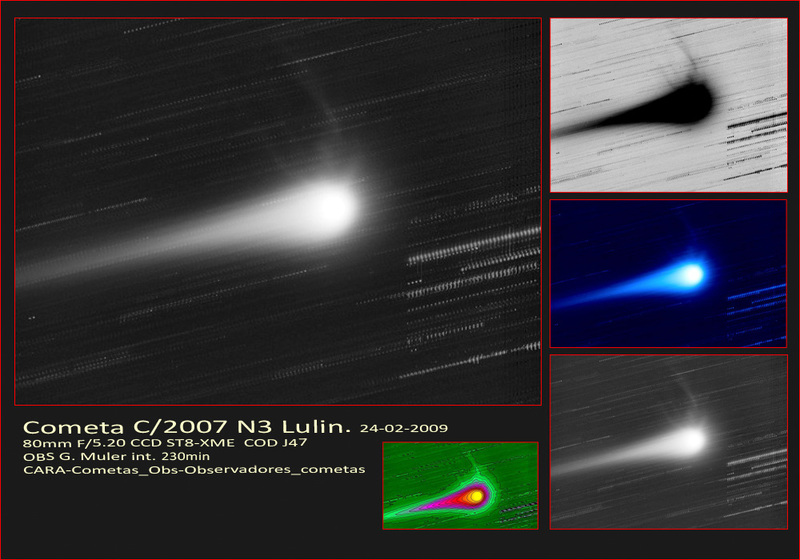 • The "curious coma-tail" of C/2007 Q3 (Siding-Spring). • And 29P on March 9. 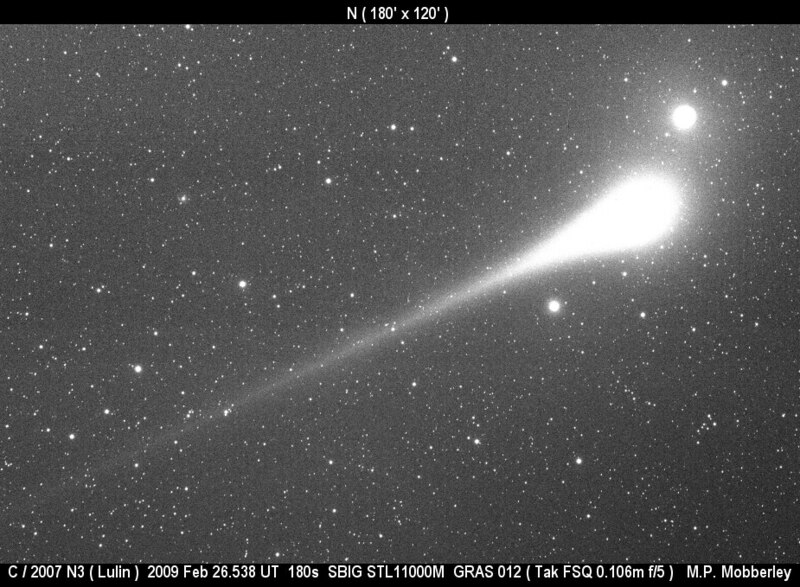 • Several meteorites from the Jan. 17 "Baltic" fireball have been found on the Danish island of Lolland. In other news Venus is already near inferior conjunction and closing in on the Sun, with the slender crescent good for near-IR imaging of the glowing night side or just for pretty pictures, e.g. on March 13 or March 9, one doesn't need much equipment for that. • Another transit of Titan has been observed on Saturn from Eastern Asia. • Some ideas what to do during a total solar eclipse - and the one from 30 years ago in an live broadcast by ABC or in the news from CBS. • The Top 10 galaxies from the new Galacxy Zoo. • Another GLOBE at Night is on; see all the links in the 1st § of this article for advice. 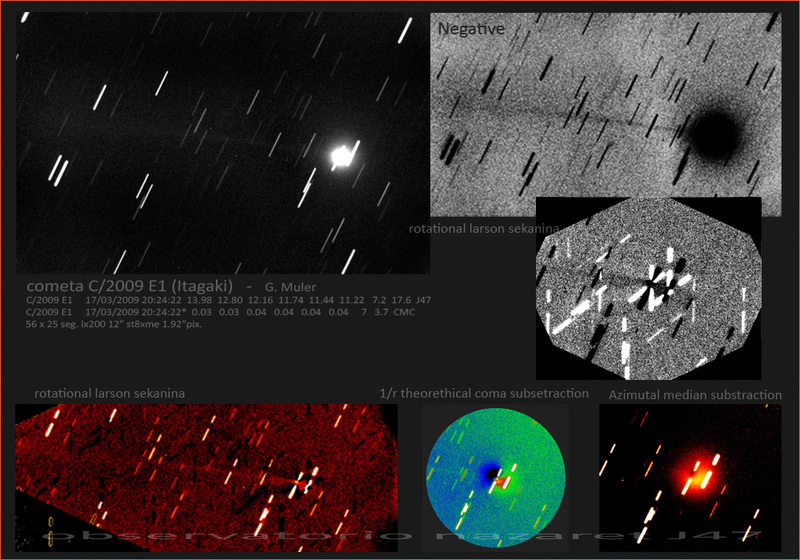 • Observations of Iridium 33 & Kosmos 2251 (the debris has begun reentering the atmosphere). • And an ISS streak over Slooh on Tenerife, the full moon of March 11 and Discovery, and a hi-res picture of a lunar crater. The main planetary action in the coming days and weeks takes place at dusk and at midnight: While Saturn is now in opposition to the Sun, Venus will almost suddenly disappear from the evening sky later this month, but as a slender crescent almost one arc minute in size. The opposition of Saturn may result in noticeably brighter rings, thanks to the opposition effect. You can find some of the best amateur pictures here, while here Pic du Midi's 1-m scope images (also hailed here) abound, including some unusual IR views. 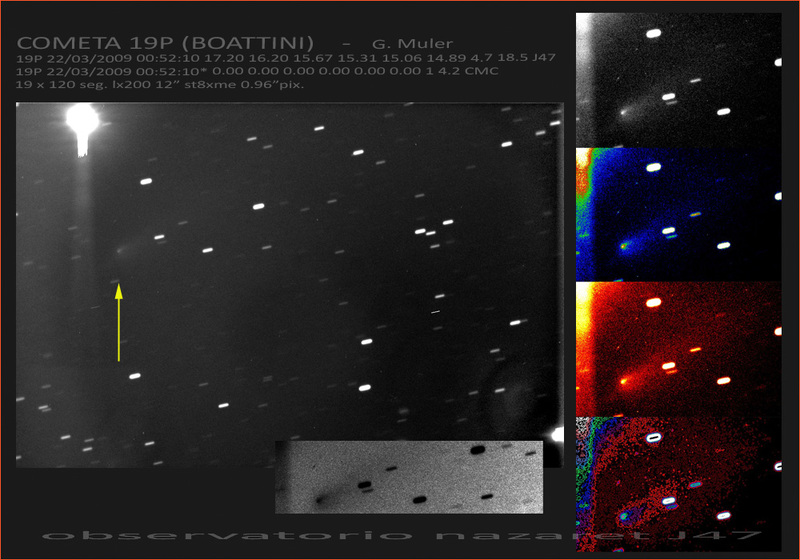 And here's another transit of Titan et al. 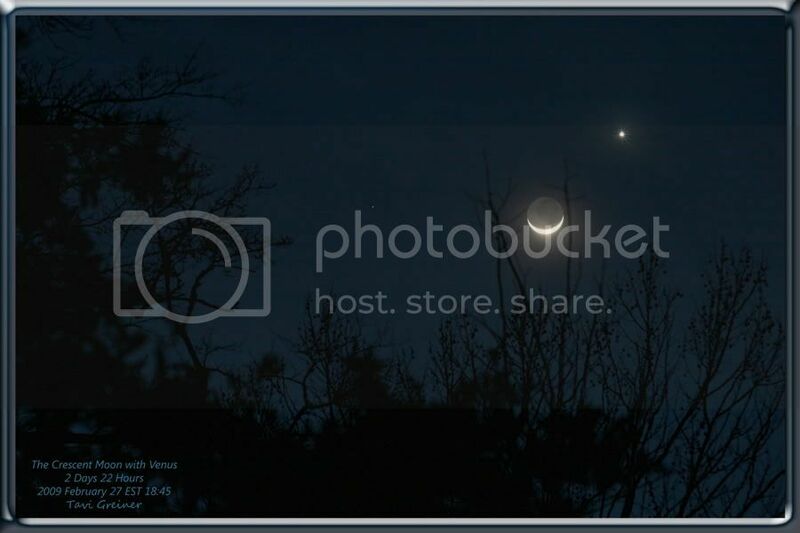 Regarding Venus's grand finale in the evening, it was possible to catch the Moon and Venus as crescents in the same FOV. 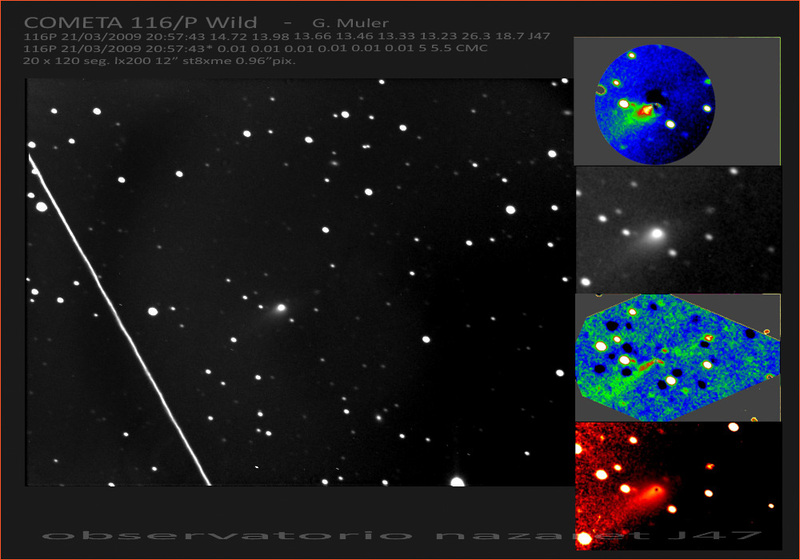 Again many great views are in the Japanese archive, including several successful detections of the nightside glowing in the IR like here. None of the results seem to match what was achieved in 2007, though, although many are trying hard (or just for for pretty pictures). The size of a telescope doesn't always matter, by the way, as an analysis of mutual events of Uranus's moons in 2007 shows (40 cm as good as 10 m). Talking of occultations, here's a recent Antares graze; the video gets better towards the end. 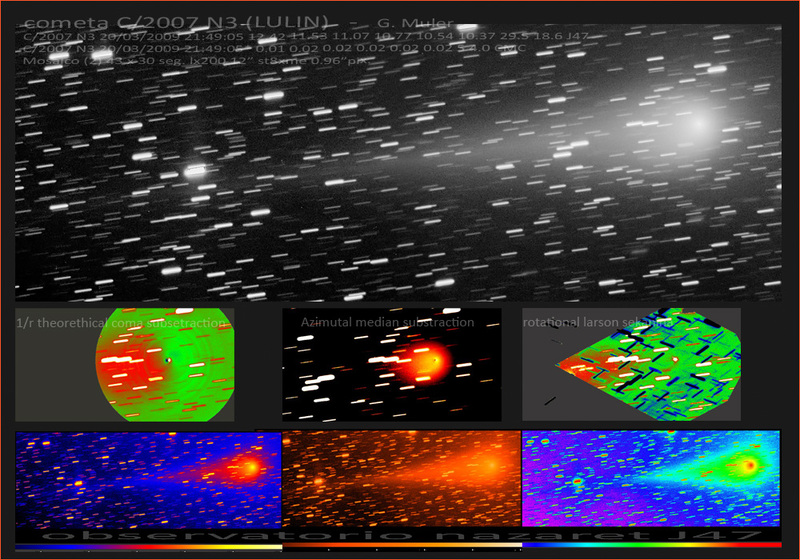 News with an impact (or 'almost'): While the launch of the LCROSS mission has slipped to NET May 20, preparings for observations of the impacts continue, with a discussion forum for observers now in place. • Did another meteorite fall in Finland? (Some info and a map.) • Here's a long story on meteorite hunting in Texas. 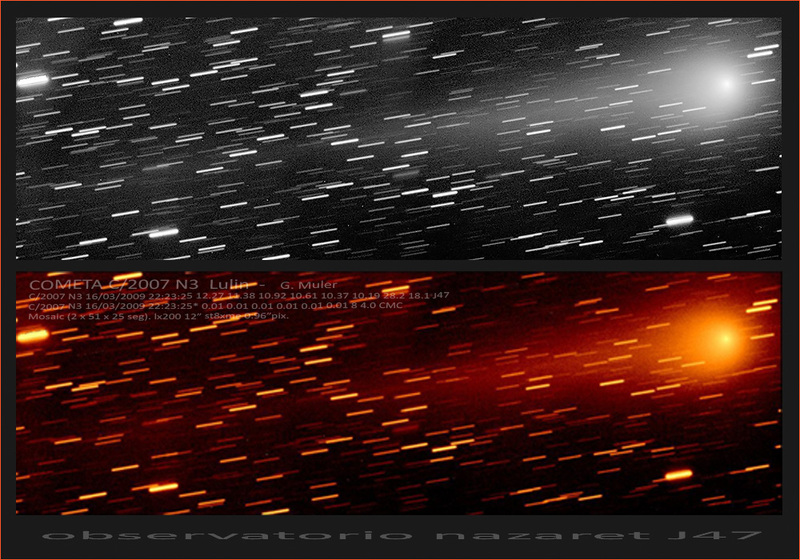 • And at least 16 pieces of asteroid 2008 TC3 have already been recovered. • After its Earth visit on March 2 we've found out that NEA 2009 DD45 belongs to the S class, has thus a high albedo and small diameter of 19±4 meters; still in the closest approaches list the object (here's the last dedicated MPEC) figures prominently (on this one it's missing). There are a picture, movie and more movies - and lots of coverage in the old and new media such as here, here, here, here, here, here, here, here, here, here and here in English and here, here, here and here in German. 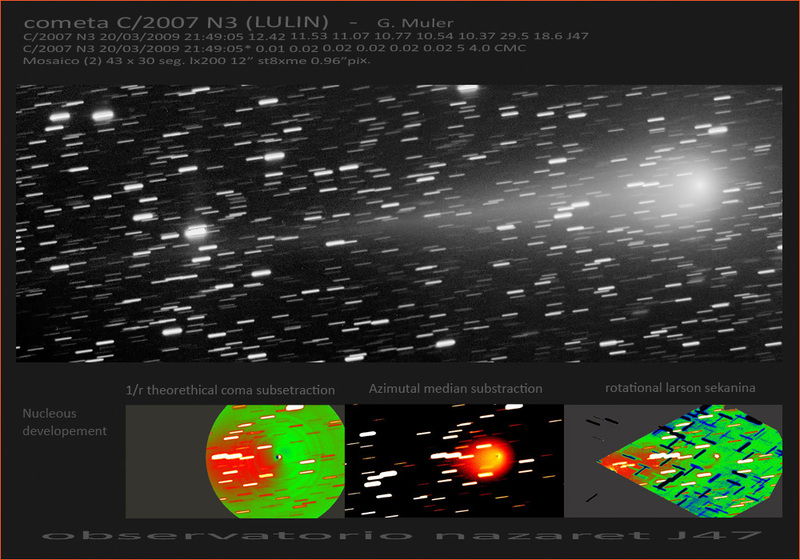 In other news the Lulin show went into a brief lunar hiatus, but there are a lot of afterthoughts and even new pictures: a nice multi-day mosaic, the light curve, excellent pictures from Southern France, a recorded webcast from Israel, a best of and thoughts and pictures by Lulin's discoverer. 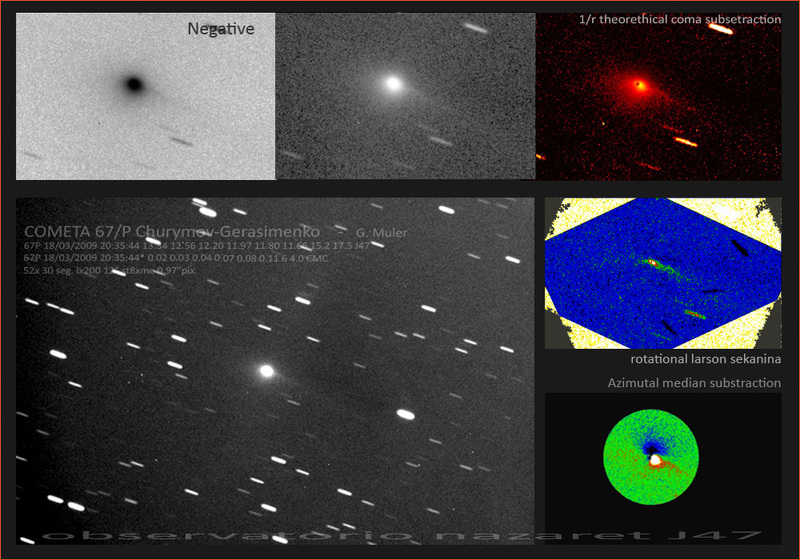 New pictures, videos and reports have come in from March 5/6 (with M44, plus a visual report), March 4/5, March 3/4 (more, more, more, an animation and a disappointment), March 2/3 (more), March 1/2 (more, more and even unguided), Feb. 28/Mar. 1 (more, also mentioned here, more, more, more, more, more and more) and Feb. 27/28. Older but cool pictures come from Feb. 25 from Oz and Italy and Feb. 23 as well as a movie from Feb. 22. 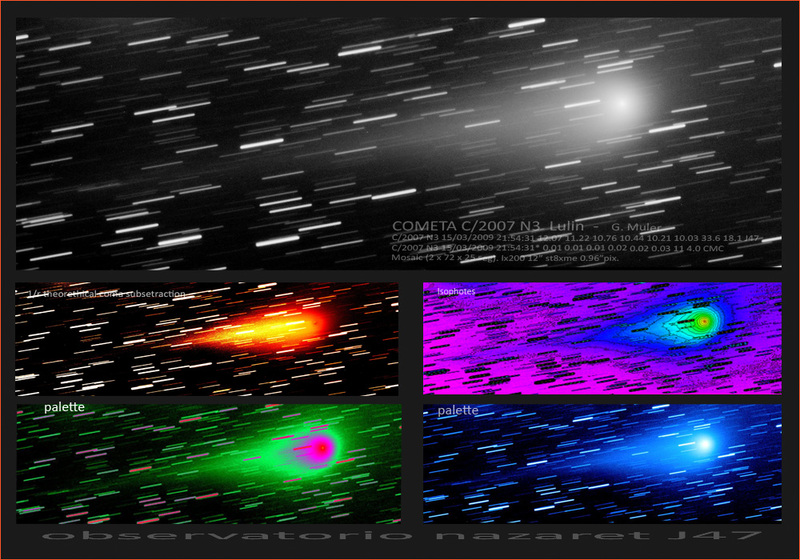 • Meanwhile yet another outburst of comet Daniel (earlier), • a "comsat cloud" and • a review of a new camera. 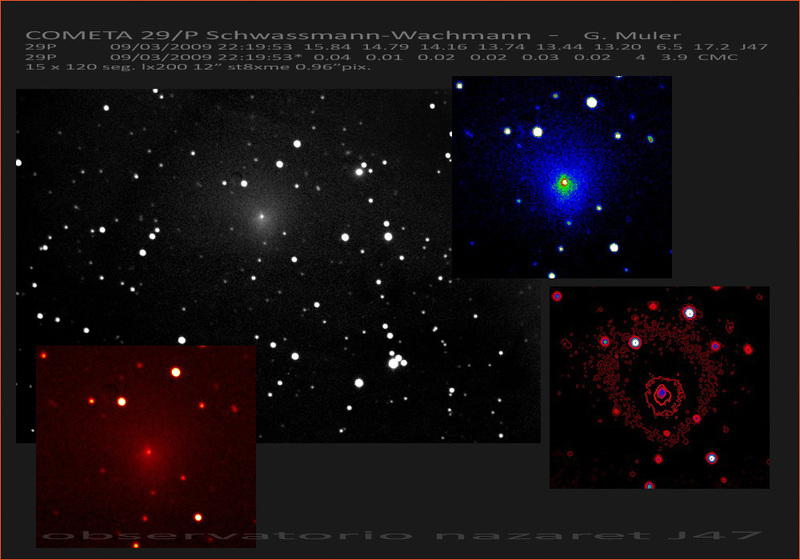 • And an Austrian amateur is making ample use of the robotic Slooh telescopes in February as well as March from Chile (earlier, still earlier) and Tenerife. 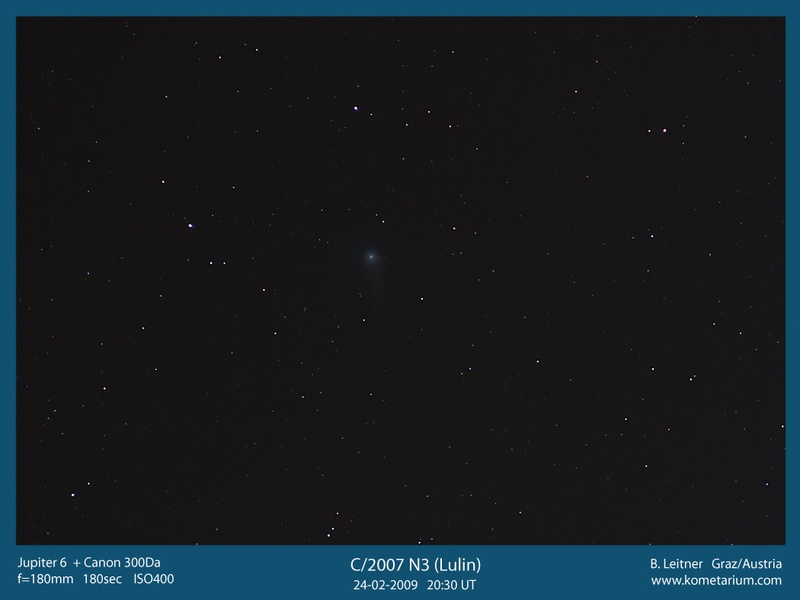 While never becoming an obvious naked-eye spectacular, comet Lulin was a pretty impressive binocular sight in the last third of February when it was closest to the Earth and the Moon was out of sight: This blogger cannot recall a case when a comet's dusty anti-tail had been visible so easily - and so long, several degrees - with little optical help. Even under bad conditions Lulin could be found. 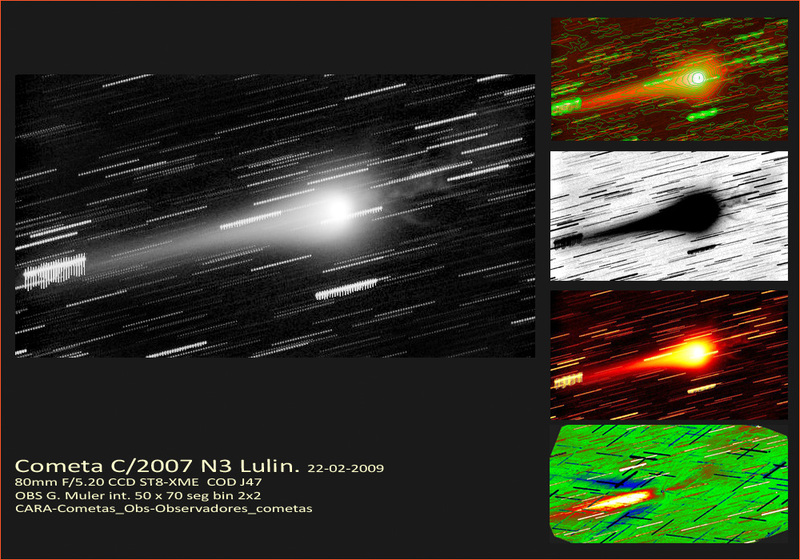 It was mainly astrophotographers, though, who could also catch the geometrically shortened but highly variable plasma tail: While not exactly a "textbook" comet (with the most obvious tail pointing in the 'wrong' direction), Lulin is certainly a unique case to remember. 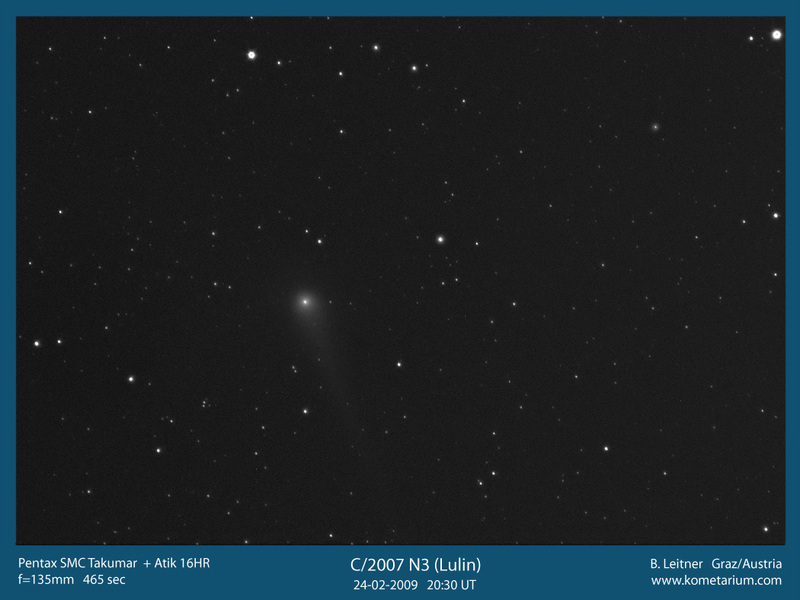 But now the Moon is rapidly creeping closer - and will actually occult the comet in less than a week. Some highlights of March, which will actually begin with a surprise visit! March 2 around 13:30 UTC: Newly discovered Near Earth Asteroid 2009 DD45 will pass only some 70,000 km from the center of the Earth, when the body of roughly 20 m diameter should briefly reach 10th magnitude. 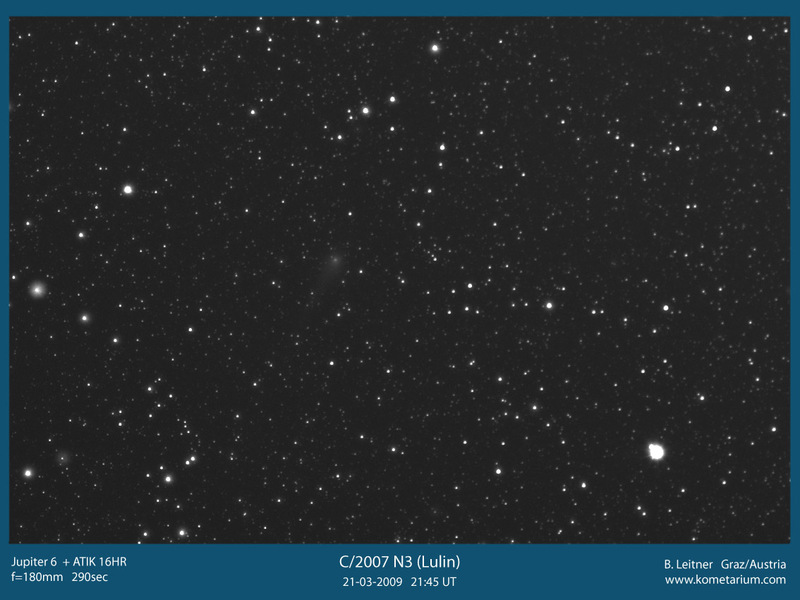 March 5: Lulin passes 2° from the open star cluster Messier 44, but the Moon is already a problem. March 7: Lulin is occulted by the Moon (which is almost full) in parts of the world. March 8: Saturn in opposition, +0.5 mag. in Leo. March 15: Lulin passes the Eskimo Nebula. March 16 to 28: Another GLOBE at Night event. March 20: Sun-Earth Day, mainly a U.S. event. March 22: Venus reaches extreme northern latitude, is evening and morning star; inferior conjunction on March 28. March 28: At 20:30 local time another Earth Hour in selected cities where the lights go out. Lulin views from February are available galore in pictures galleries like this or this or this or this or this. Some selected observations of Feb. 28/Mar. 1 (sum, more, more, more from here, more), Feb. 27/28 (looks quite like the visual impression; more, more, more, more, more), Feb. 26/27, Feb. 26 (more), Feb. 25/26 (more, movie), Feb. 25, Feb. 24/25 (video, more, more, more, more, drawing, more, more, more, more), Feb. 23/24 (detailled and another drawing, vis obs., report, more, more, earlier, more, more, more, more), Feb. 22/23 (from here; more, more, more, more, more), Feb. 21/22 (excellent video, another, another and a strange one; a great color picture, more, more, more, more and more), Feb. 20/21 (more, an animation, alt. 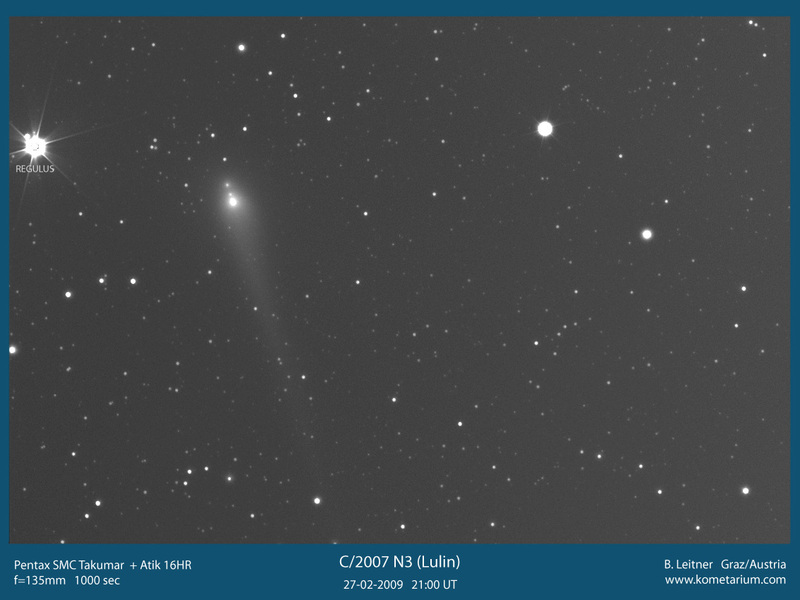 version, picture from here, estimate at 4.9 mag. ), Feb. 19/20 (several pics, animation, with Amphitrite, a drawing, picture) and Feb. 18/19 (more). 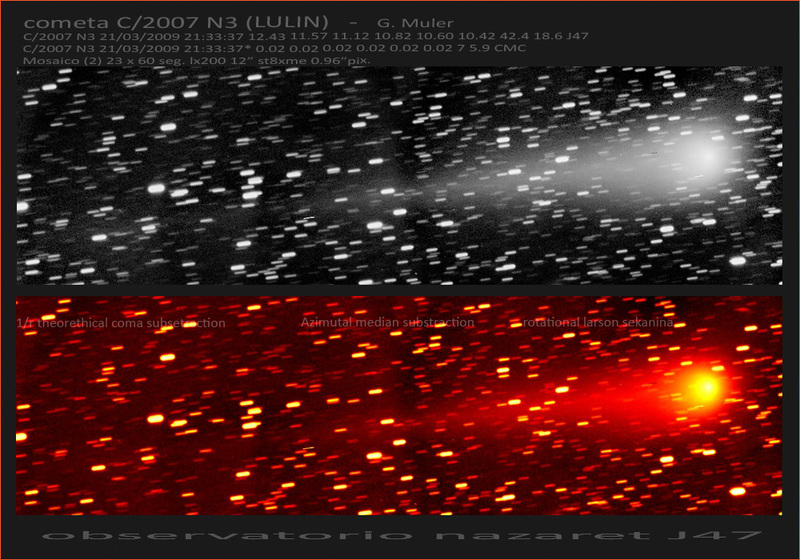 Lulin was also observed in X-rays; there is an analysis and Q&A, and general articles are e.g. here and here and here and here and here and here and here and here and here and here - and the comet even made it onto U.S. radio and into German TV. In other news there was again a nice conjunction of the Moon and Venus: pictures of Feb. 28 from Tenerife and India, Feb. 27 from the U.S. (more, more, more, more), Tenerife, India (more in the stream) and Australia (more pics) and Feb. 26 from Tenerife. 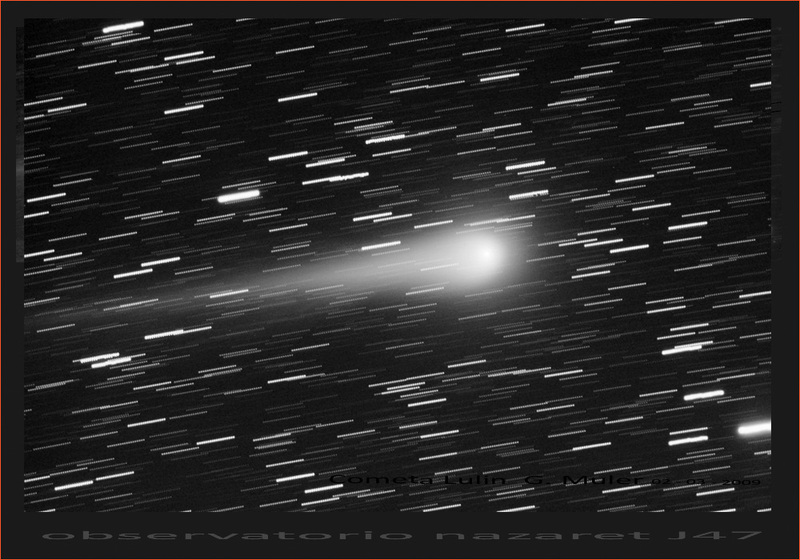 • A few days earlier a "massing" in the (Southern) morning sky: pictures of Feb. 24, Feb. 23 (APOD; more) and Feb. 22. 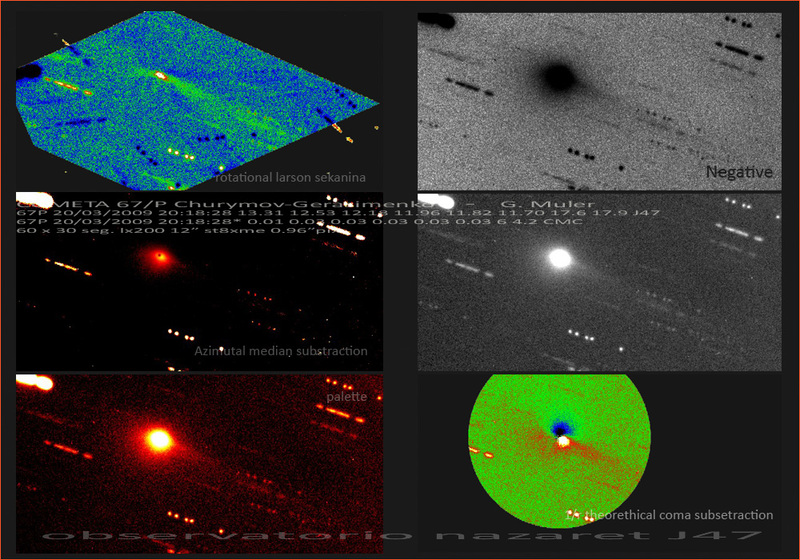 • A moonrise with omega effect had considerable media impact - and on the same day this blogger caught an omega sunset from Tenerife, after witnessing an omega sunrise in eclipse in 2006. • The weather prospects for the 2010 ASE, the aurora from Norway and the ISS over Puerto Rico. 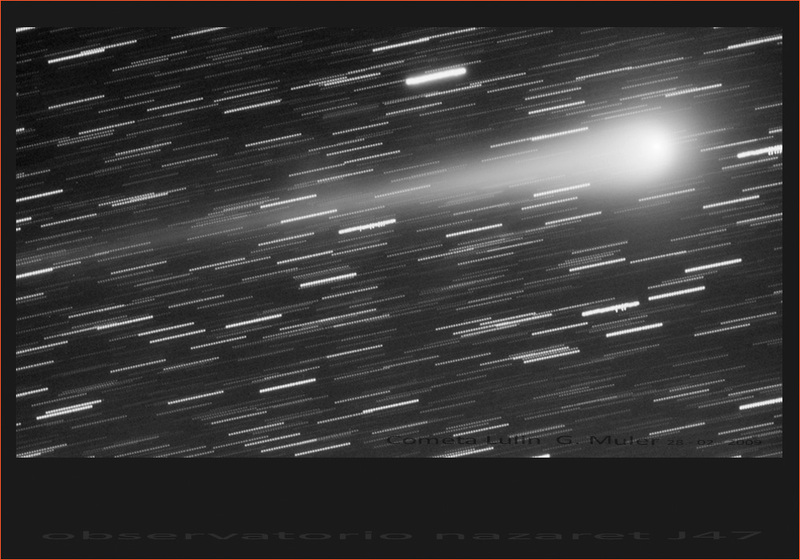 • And this blog was mentioned in a blog on the recovery of meteorites (also many earlier entries!) from the Texas fireball - soon eight were found by the various searchers. 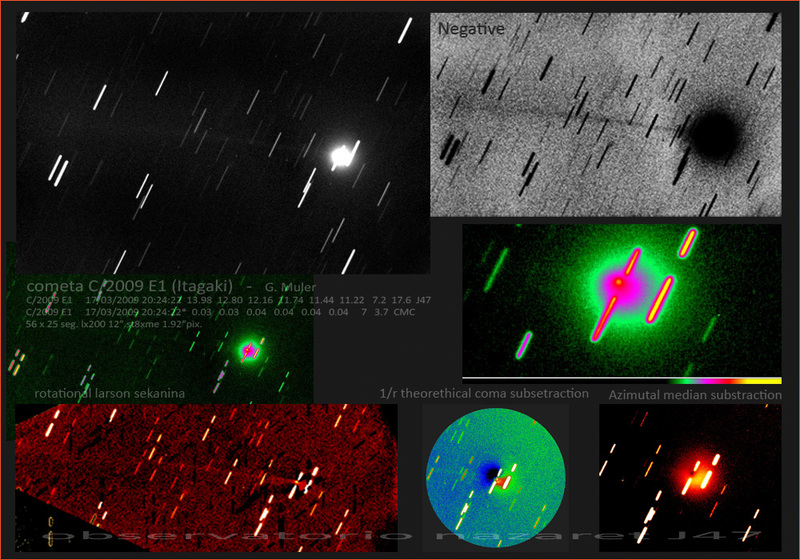 • And a meteorite related to the predicted Sudan bolide has been found!